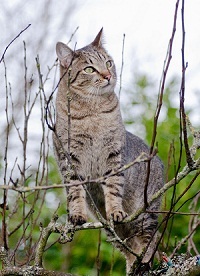 I just saw a very similar looking cat cross 15th Ave (headed east) as I was turning onto Stevens. By the time I turned my car around, the cat moved on. Not sure if it was Messi, but wanted to share just in case. Thanks, I may call you and take you up on your offer. I am headed up to that area now to do some door knocking while people are outside in the nice weather. We also got a fairly confident sighting from Sunday morning on 18th Ave S between Stevens and Forest so the two sightings are only 3 blocks apart.